Financial calendar Financial Results 2014 ___________________________________ 26 February 2015 Annual Report 2014 ____________________________________ 13 March 2015 Annual General Meeting ________________________________ 6 May 2015 Interim Report/Financial Results 1Q _______________________ 12 May 2015 Interim Report/Financial Results 2Q _______________________ 7 August 2015 Interim Report/Financial Results 3Q _______________________ 6 November 2015 Important dates for shareholders and analysts1 Allianz SE – Königinstrasse 28 – 80802 Munich – Germany – Telephone +49. 89. 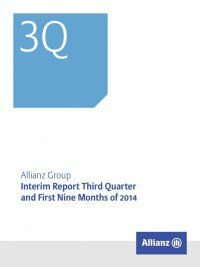 3800-0 – info@allianz.com – www.allianz.com Interim Report on the internet – www.allianz.com/interim-report – Design / Concept: hw.design GmbH – Date of publication: 7 November 2014 This is a translation of the German Interim Report of Allianz Group. In case of any divergences, the German original is legally binding. 1 The German Securities Trading Act (“Wertpapierhandelsgesetz”) obliges issuers to announce immediately any information which may have a substantial price impact. Therefore we cannot exclude that we have to announce key figures related to quarterly and fiscal year results ahead of the dates mentioned above. As we can never rule out changes of dates, we recommend checking them on the internet at www.allianz.com/financialcalendar.